I seem to surround myself with things I believe to be true in my life. For example, I love roses, so it wouldn’t take long before you ran into one rose or twenty around my house (blog post A Simple Rose). I have a love of lighthouses because to me they represent that Christ is the way, and He is the light of the world. I will write about that one day. Now, my new thing is vases, especially clay vases. Don’t we tend to surround ourselves with what we are focusing on? Don’t believe me… take inventory of what your thoughts are focused on, and I bet you will find an object of your focus and attention. Our life speaks volumes about what we believe to be true. One day, I was watching Brandon work away at molding his little clay masterpiece. I couldn’t help but think about this verse found in Jeremiah 18, which says, “Then I went down to the potter’s house, and there he was, making something at the wheel. 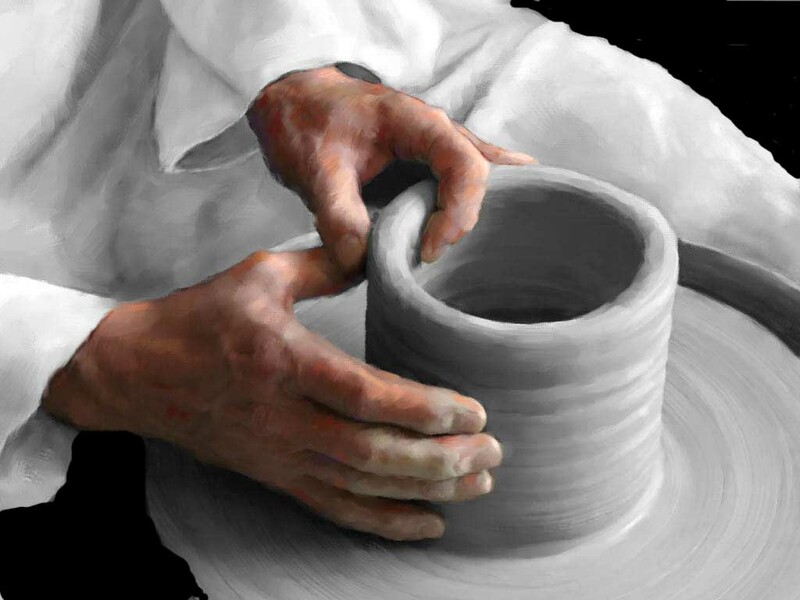 And the vessel that he made of clay was marred in the hand of the potter; so he made it again into another vessel, as it seemed good to the potter to make.” I know this verse is talking about God wanting to reform Israel into everything He created them to be. Since all scripture is inspired by God, I can apply this to my life today. I want to be clay in the potter’s hand. I was once marred and cracked and full of holes. I am so glad that my Creator didn’t see me as something that need to be tossed in the trash; instead He saw something of value. Something He knew once healed with His saving grace, molded by His loving hands, and filled up with Himself. That vessel would be of perfect use. Thank you Jesus the work you have done. I know there are many around me who feel like broken down, marred, and cracked like that pot. Life has beaten them up. They feel like they could never be of any use to God. The good news is He wants to lift you up out of the heap. He wants to make you into a new creation. He wants to use you to bring glory unto Himself. He wants to set you up on a mantel and without hesitation and say, “That one belongs to Me”. I am glad God uses cracked pots like me. I want to continue to be easily molded and available for what ever He chooses in my life. I don’t know what Brandon made that day with his clay, but I am sure it was beautiful!
. Thank you! Exactly where are your contact details though?